Do you have a great location? A place with a large flow of people but with a limited catering offer? 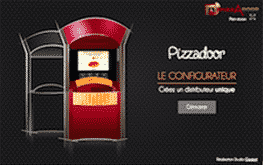 ADIAL and its partners offer you a complete and adapted solution: PIZZADOOR offers the possibility to have a delicious pizza, 24/7. This innovation guarantee safety and is adapted to the current consumer demand.